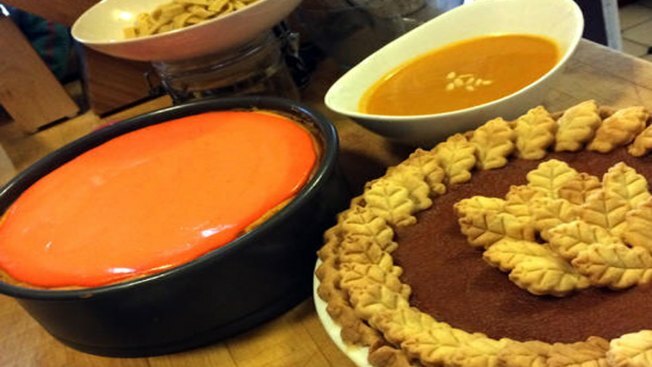 Put a little pumpkin in soups, pies, cheesecakes and cookies. I love when pumpkin season rolls around because pumpkin is one of those ingredients that works well in both sweet and savory dishes. The cheesecake, pie and soup recipes are ones I've shared in the past. But, today I’m adding two new ones, pumpkin pasta and pumpkin fig bars. Both require a little extra work but the tasty results are well worth it. Combine flours, salt, cinnamon and nutmeg in a large bowl. Mix 1 egg with the pumpkin puree and water in a small bowl and set aside. Stir remaining egg into flour mixture until ingredients are just moistened and then add the pumpkin mixture. Work mixture into a dough and knead it for about 5 minutes. Wrap dough in plastic and set it aside at room temperature for at least 30 minutes. Divide the dough into 4 equal portions and work each portion separately. Using the pasta machine, run the dough through multiple times continually reducing the thickness until you reach a medium setting (#5 on my pasta machine). Then, run the dough through the noodle attachment. Lay the noodles onto a semolina floured surface. Dust with a bit more semolina flour so that noodles doesn’t stick to each other and then place on a drying rack. You can also place a paper towel over a chair and put the noodles over that if you don’t have a drying rack. Let noodles dry for about an hour or two and then place them in a plastic bag until ready to use. Pasta can be refrigerated at this point if you like. To cook pasta, simply drop it into lightly salted boiling water for 4 minutes. Drain and add to your sauce. To make the sauce, start by slicing the sage. Stack all but 3 or 4 leaves on top of each other. Roll them up tightly and then thinly slice the roll to form thin strips. Set the whole leaves aside. Melt butter in a large saucepan over medium heat. Add sage strips and stir until butter starts to turn a golden brown. Add the whole sage leaves, lemon juice and sugar, and stir for about a minute. Add pasta and toss to coat. Transfer to serving bowls and serve hot. Mix flour, baking powder, baking soda and salt together in a large bowl. Set aside. In another bowl, cream together butter and sugar. Add vanilla. Add in 1/3 of the flour and 1 egg and mix well. Repeat until all ingredients are fully incorporated. Wrap dough in plastic and refrigerate it for at least two hours. Meanwhile, place all filling ingredients, except the pumpkin, in a medium saucepan. Bring to a boil and simmer for about 10 minutes until most of the liquid cooks off. Stir in pumpkin and continue to simmer for an additional 5 minutes until mixture is rather dry. Remove from heat and allow to cool. Place ingredients in a food processor and blend until smoother. Transfer filling to a bowl and set aside. Split chilled dough into two portions and work them separately, keeping the unused portion in the refrigerator. Roll out dough to just over a 9” x 12” size. Using a sharp knife, cut the dough to exactly 9” x 12”. Cut this larger rectangle into three 3” x 12” strips. Place 1/2 of the filling into a disposable plastic bag and cut about 1/2” off one corner. Squeeze a line of filing down the center of each strip. Use all of the filling. If dough has become soft, place everything in the refrigerator for 15-20 minutes. Preheat oven to 350 degrees F. With each rectangle, gently bring up the sides and pinch them together over the filling. Place the log onto a baking sheet, pinched side down, and flatten it a bit. Repeat with remaining portions. Bake for about 15 minutes or until logs are are just starting to lightly brown. Remove from oven and allow to cool slightly. Slice bars into 1 1/2” pieces with a very sharp knife and then let bars cool completely. Cut margarine into small cubes. Cut or pull cream cheese into small pieces. Combine all three ingredients. Using your fingers, mix to form a dough (you can also put ingredients in a large food processor and process until dough forms a ball). Knead for about 30 seconds. Split dough into two equal parts and wrap in plastic wrap and refrigerate for an hour. Roll out one pie crust and transfer it to a pie pan. Crimp edges of crust using your fingers. Place plan on a baking sheet and set aside. In a large bowl, mix pumpkin with granulated sugar and brown sugar until smooth. Add milk, eggs, vanilla, nutmeg and cinnamon. Pour mixture into crust. Loosely tent the pie with aluminum foil that is domed high enough so that the filling won't come in contact with it during the cooking process. Place pie into oven and bake for 15 minutes. Reduce heat to 350 degrees F and bake for an additional 50-60 minutes or until filling is set. Carefully remove the aluminum for the last 20 minutes of the baking process so crust can brown. Remove pie from oven and allow to cool. If you want to include the leaves for your pie, roll out the second pie crust to the same thickness as the first crust. Using pastry cutters, cut out as many leaves (or whatever cutter pattern you choose) as you can. Take the scraps and roll them out again to cut additional leaves. Place the leaves on a baking sheet and place them in the oven along with the pie once you've lowered the temperature to 350 degrees. Bake for 15-20 or until golden brown. Remove from oven and allow to cool while pie is baking. Once you remove the pie from the oven, carefully arrange the leaves on the pie, slightly pressing them into the slowly settling pie surface. I sometimes line the bottom of my springform pan so that it's easy to remove the cheesecake and place it on a serving platter. This is an optional step. But, if you'd like to do it, cut a parchment paper circle the same size as the base of your spring form pan and place it in the pan. I usually spray the bottom of the pan with a baking spray so that the parchment paper sticks. Preheat oven to 350 degrees F. Finely grind graham crackers in a food processor and then transfer them to a bowl. Melt butter in a small pan or in the microwave and pour over graham crackers. Mix thoroughly and pour all but about 1/4 of cup into your springform pan. Press the graham crackers about halfway up the side and on the bottom of the pan as uniformly as possible. Bake the crust in the oven for 12 minutes. Remove and set on a wire rack to fully cool, about 30 minutes. In a large bowl, with either a stand mixer or electric mixer, cream together the sugar, cream cheese and mascarpone cheese. Mix thoroughly for about 5 minutes at medium high speed. Add eggs, one at a time, and continue to mix. Add bourbon, vanilla, lemon juice and salt. Mix for an additional 3 minutes. Pour mixture into your cooled springform pan. Place pan on a baking sheet and bake for 40-50 minutes. The outside edges of the cheesecake will be stiff but the center will still be soft and jiggle a bit. Remove the cheesecake from the oven and increase the oven temperature to 400 degrees F. Let the cheesecake cool for 30 minutes. The cake will settle a bit. Mix together sour cream, bourbon, sugar, vanilla and lemon juice. Once cheesecake has cooled, gently spoon the topping over the cake and spread it evenly. Bake for an additional 10 minutes. Remove from the oven and let the cheesecake rest at room temperature four about 45 minutes. Then, place the cheesecake in your refrigerator for 4 hours or longer until it is fully set and chilled. Just before serving, crumble the remaining graham crackers and form a circular ring about half the diameter of the springform pan. Melt butter over medium heat. Add onions and jalapeños and sauté until soft. Add garlic and cook for about two more minutes. Add pumpkin, chicken stock, salt, and bouillon cubes. Bring soup to a boil and simmer for about 30 minutes. Remove from heat and puree in a blender in batches. Be very carful as you start the blender because contents can sometimes fly out (be sure to do it in small batches). Return to a medium heat. Add cream here if you choose, making sure not to boil soup. Take out 1 cup of liquid and blend it with the flour in a small bowl, stirring until all lumps are gone. Add mixture back to soup. Cook for an additional 5 minutes until flour mixture is fully heated and incorporated. Season soup to taste. Ladle soup into serving bowls. Sprinkle with toasted pine nuts and garlic croutons -- homemade are the best. Enjoy! A variation to this dish: Rather than using croutons, try toasting thin slices of french bread. Set those aside and then roast shrimp that has been seasoned with a little salt, pepper and chili powder. Place a shrimp or two on a crostini and float it on the soup. Top with pine nuts and serve. This dish is also great served in a pumpkin soup bowl. Simple cut the top off of a medium sized pumpkin (reserve the top). Scoop out the seeds and rinse the inside of the pumpkin. Turn upside down to drain. Just before ready to serve, place the pumpkin in an oven that has been preheated to 250 degrees. Warm for about 10 minutes then place on a nicely folded napkin inside of a regular bowl. Ladle the soup into the bowl and place the top back on the pumpkin and serve.